It's not surprising that a duo that's named itself after a railroad that used to connect St. Paul to Duluth would specialize in tunes weaving in Minnesota history and themes. 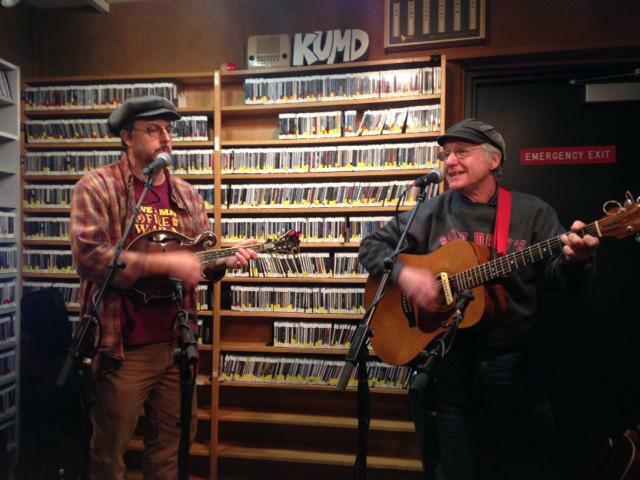 Fred Keller (mandolin) and Tom Cornish (fiddle and guitar) joined us in the studio on February 5, 2015 to share some of those originals and selections from their repertoire of string band, Tin Pan Alley, and swing music. They had a release show in town for their debut album, Up the Road & Down the Flats, the following night. long-running blues band Azure du Jour and, more recently, Red Cowboy Hat, as well as solo releases. He joined us in the studio to perform some new tunes in advance of Red Cowboy Hat's slot at the Homegrown Winter Fiasco on Friday, January 22 at the Gopher Bar and Grill in West Duluth. Jim Walsh is a longtime Minneapolis music writer and songwriter who's been organizing the Mad Ripple Hootenanny for nine years. It's a weekly affair in the Twin Cities, with a rotating cast of musicians swapping tunes, but occasionally the Hoot hits the road. Walsh joined us along with his brother Terry (Belfast Cowboys/St. Dominic's Trio) and singers/songwriters Devaney and Collins on January 18, 2015 on the way to a Hootenanny performance at Lutsen the same night. This Wisconsin guitar/fiddle duo joined us for a session on January 15, 2015. Along with their repertoire of classic and original tunes inspired by hillbilly, ragtime, vaudeville, western-swing, and old-time fiddling tunes, they've picked up some Scandinavian-influenced regional tunes of the upper Midwest from their old-timer neighbors. They were in town for two performances. Singer/songwriter, artist, member of the Leech Lake Ojibwe, former marine, and mom; Annie Humphrey is all of these things. She joined us in the studio January 8, 2016. She had a CD release show the same night at the American Indian Community Housing Organization in Duluth, with a display of her art work. Annie performed for our Ojibwe Then and Now concert last year; find the audio under "Related Content" below.